Are you an ESL teacher searching for past perfect continuous tense exercises? 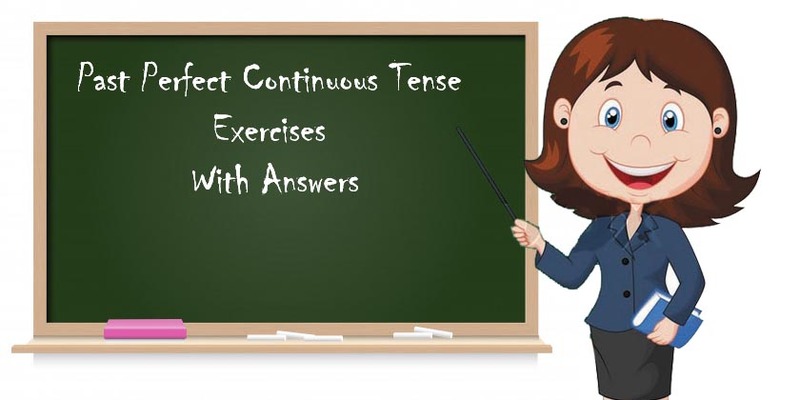 In the article below we have prepared past perfect continuous tense exercise with answers. Practice with students and compare their answers with the corrects answers given in the article. Complete the sentences in the Past Perfect Progressive. 1. Laura needed a break because she (solving)______________________ past perfect continuous tense exercises all morning. 2. When Lorraine moved to England, she (learn)______________________ English for 12 years. 3. I did not go out last night because I (work)____________________________________ all day. 4. Orla felt fit for the marathon because she (exercise)___________________________ a lot. 5. When I went to see Miss. Winter, her secretary told me that she (speak)________________________on the phone for two hours. 6. You got sick because you (eat)_____________________________ all the time. 7. When the musician became director of the opera house, he (live)__________________________ in this town for ten years. 8. We (go)____________________________ out together for two years before I met his family. 9. The passengers (wait)_____________________ for four hours before the ground staff could finally give them information on the delay of their flight. 10. When I noticed my mistake, I (drive)__________________________for an hour in the wrong direction. 1. She ___________________________________________ (not/sit) at home for long before she went out. 2. Had _____________________________ (they/stay) in a hotel before they found a flat in Warsaw? 3. Mary __________________________________________ (not/wait) long when he turned up. 4. How long ______________________________(you/ learn) English before you took TOEFL? 5. Jack ______________________________(work) on the project for at least half an hour when the boss came in. 6. Had __________________________ (she/sing) for a long time when that crazy fan attacked her? 7. Why were you so hot when we met? ____________________________(you/run)? 8. She ______________________________ (see) Mike for only six months before she married him. 9. Had _________________________ (you/think) about that problem before Tom started talking about it? 10. They ______________________________________ (not/fly) for a long time when the plane crashed. 11. Had______________________(Mark/do) such kind of things before or was that the first time? 12. We _______________________________________________ (travel) all day before we got to Madrid. 13. __________________________ (you/work) in a garage? Why were you so dirty when I saw you? 14. They ____________________________ (not/practice) the piano for long before they were ready to perform. 15. Had __________________ (she/train) guide dogs for a long time before she changed her job? 16. My friends _____________________________ (not/drink) alcohol before they went to that club. 17. Had ________________________(Maria/drive) for many hours when that accident happened? 18. The man ______________________________________________(not/paint) the walls all day long. 19. It ________________________________( not/rain) before we went out. 20. Why _______________________ (you/behave) so strangely before I talked to you? 1. I _______________________________________________(work) all day, so I didn’t want to go out. 2. She __________________________________________(sleep) for ten hours when I woke her up. 3. They ______________________________(live) in Beijing for three years when he lost his job. 4. When we met, you ______________________________ (work) at that company for six months. 5. We (eat) __________________________________ all day, so we felt a bit ill.
6. He was red in the face because he ___________________________(run). 7 . It ___________________________________________(rain), and the road was covered in water. 8. I was really tired because I _________________________________(study). 9. We ____________________________________(go) out for three years when we got married. 1. I _____________________________________________________ (not / work) there long when she quit. 2. She _________________________________________________ (not / work) but she was tired anyway. 3. It __________________________________________________________(not / rain) long when I got home. 4. He was in trouble with the teacher because he___________________________________(not / go) to classes. 5. We ____________________________(not / live) in London for three years when we got married. 6. Although it was hot in the kitchen, Julie ________________________________ (cook) for hours. 7. I _____________________________________not / sleep) long when there was a knock on the door. Exercise 1. Exercise 2. Exercise 3. S1: How long had you been living in the USA before you decided to move back into your homeland? S2: I guess we`d been living there for over fifteen years by the time we left. S2: Yeah, it sure was. S1: So tell me what had you been doing for a living over there? S2: Well, I`d been a student the whole time, but my father and older brothers had been working in different fields until we decided to leave the USA. S1: And when did you get back to your country. S2: I think it was 2010. S1: So what have been doing over here since then? S2: I have been a student at SBK University since we returned to Quetta. Solve past perfect continuous tense exercises then compare your answers and with the correct answers given above, and if you find any mistake in the article, please feel to mention it in the comment section below.